There’s truth in that statement. 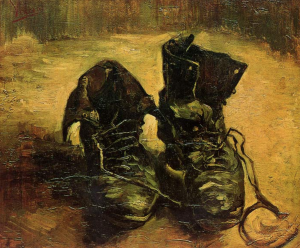 Van Gogh transformed worn leather and scruffy boot laces into swirling masses of sensual paint, playful silhouettes backlit by a golden field. 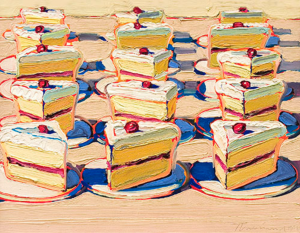 Pop artist, Wayne Thiebaud, chose pastry as his motif, laying down luscious impasto, thick as frosting. 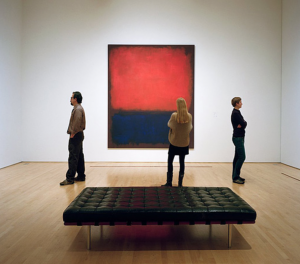 Mark Rothko gave us fields of pure color, an invitation to contemplate the infinite. So anything goes. That’s all well and good, but an artist still needs to decide. Subject matter matters. I’m at work all the time, in search of subject. At the grocery store, coffee shop, market, mall, and gas station, peering down alleyways, up stairwells, into windows. I can’t seem to turn it off, and quite frankly, wouldn’t want to. Waiting in line at the bank provides an opportunity to study anatomy. Machines are fascinating forms, food on the plate: color, texture, shape. The neighborhood recycling center becomes a study in turning visual chaos into order. 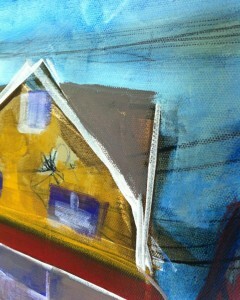 But there are only so many hours in a day and canvases to fill. I can draw everything but painting represents a bigger commitment. What subjects are truly worth the effort? I’ve made lists, came to the conclusion that I am a storyteller. Only I don’t deliver the whole narrative, just a snapshot, a fixed point, a suggestion. The images say, “Look at this. Does it mean anything to you? Do you see something you recognize? Someone?” Maybe the paintings ask a question, beg an interpretation. 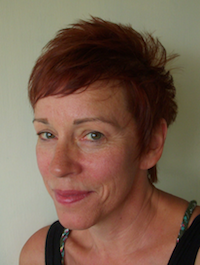 Common themes emerge, the overlooked, the back side of things, an unseen point of view, an unusual perspective. 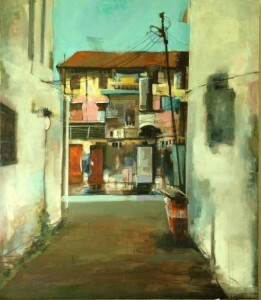 A solitary dress hangs from the bedpost, a casino towers above a ramshackle house, seamstresses peddle away on an old machine, alleyways lead you to a vertical slice of culture. The ordinary becomes extraordinary, transformed by art. Old boots and pastry. Start your “clean up” well before it’s time to leave the studio. This can be a very productive time. 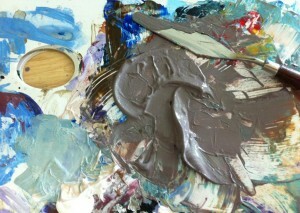 You’re warmed up and there is an array of unused paint on your palette. Mix it all up. The result is often an amazing gray you couldn’t possibly make intentionally. Look around the studio at your paintings (you should have more than one going), and think about where to use the gorgeous gray. Neutrals are necessary to balance high-key or intense colors. Metaphor for life. This entry was posted in All, Art Lessons, USA, Work in Progress on February 29, 2016 by artconsp. Another inspiring post! Can’t wait to come see your new studio! 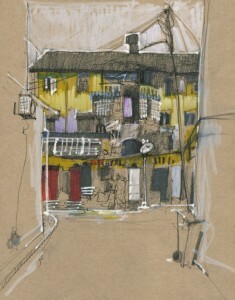 I was in India volunteering last month and tried to sketch on location. I thought I was hidden and not very obvious. I drew a crowd and the children pleaded for my pens so they could sell them for money. My meager sketch kit was such a luxury compared to the hard lives they lead. How do you deal with that in Asia? Loving the studio and your updates! Sketching in Thailand, I am most often left alone although I’ve gotten a few strange looks for drawing the recycling center instead of the pretty temple just behind me. During my travels in Southeast Asia, I haven’t had a problem with being asked to part with my art supplies although I haven’t been to India. I do have one story though, about a little girl in Burma who wanted me to buy something from her. Instead, I thought I might part with one of my precious colored pencils as a gift to her. But when I pulled one out, she called to a gang of friends to come join in! I had no choice but to scram or lose the whole kit and caboodle. “…. it’s how you paint it.” Love that line. Love all the images you added to your post, Amy, and the startling difference between sketch and painting (or same thing) or the translation of the drawing into the painting. Both work and both are very different. 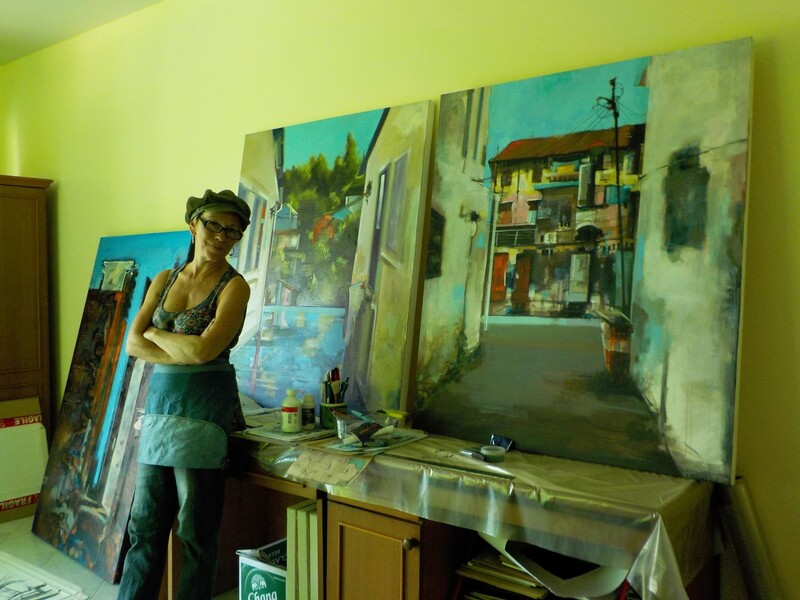 Looking at all the “in process” paintings sitting on tables in your studio — lots of alleyways. Yummy, exciting, intense …. I’m excited to see it all together at BAC in September! Your selection of quotations for this blog and others, earlier and later, are so rich. And I could not agree more about this one. Any subject is suitable. I love when the subject finds me and the way of presenting it develops and shows itself. Take photos, for example, of fingertips and fingernails. Paint or draw Irish cows or faces of shoe repairmen. Begin a fictional tale in a hardware store or on the roof of a building in Chernobyl.